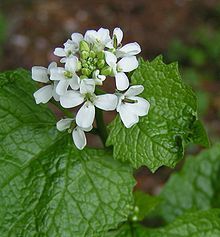 Garlic Mustard grows throughout the UK and in most of Europe. In the USA it is abundant in the mid western and north eastern states, but can also be found as far south as Kentucky and North Carolina. In early spring, the light green leaves start to show in the hedgerows and woodland. The plants can vary in height from 5-8 inches up to 3ft. 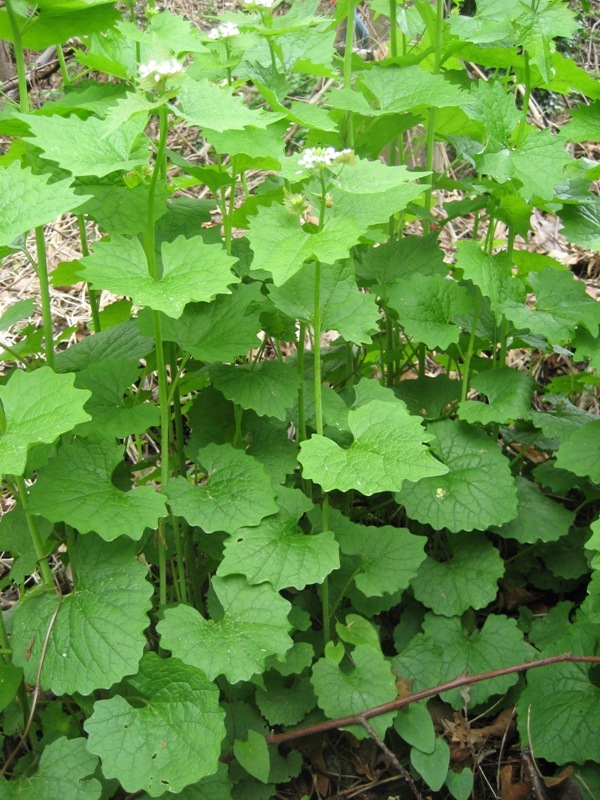 The broad, heart shaped leaves are toothed, and at the base of the plant grow on fairly long stalks. Near to the top the leaf stalks are shorter and the leaves have prominent veins. The flowers have four tiny white petals that grow at the top of the plant in a cluster of tight green buds and white flowers. Much smaller unopened flower heads spring from the angle of the leaf stalks and main stem. Common names are: Hedge Garlic, Sauce-all-Alone, Jack-by-the-Hedge and Poor Man’s Mustard. When bruised the whole plant has a smell of onion rather than garlic. In 1657 William Coles wrote that is was eaten by many country people as sauce to their salt fish, and helped well to digest the crudities and other crude humours that are engendered by the eating thereof. Early herbalists used the leaves for dropsy and to induce sweating. The herbalist Sir John Hill recommended that they should be boiled with honey to make a syrup as a remedy for coughs and hoarseness. The leaves were also believed to have antiseptic properties and were applied as dressings to open sores and ulcers. Eaten as a fresh seasonal food it is good for the digestion and as a spring tonic for the whole body. Sometimes you can find garlic mustard with exceptionally large leaves. These may have large, whitish, fleshy taproots, which taste like horseradish. They are good from late autumn to early spring, before the flower stalks appear. Use them like horseradish, grated into vinegar, as a condiment. The pungent, mildly bitter basal leaves are good from late autumn to early spring, the plants seem to become more bitter as they mature. However the arrowhead shaped stem leaves are more pungent and less bitter in the spring along with the tasty white flowers, than the basal leaves. Use garlic mustard raw in salads, mixed with more mild greens. It’s also good steamed, simmered, or lightly fried. It can also be used in sauces. Cook no longer than five minutes, or the leaves will become mushy. Chop the garlic and the garlic mustard roots finely, preferably in a food processor. Add the parsley, garlic, garlic mustard leaves and basil and chop. Add the pine nuts and chop coarsely. Add the olive oil and the stock gradually and process until you create a coarse paste.